Many of us use the start of a new year as a reason to commit to change, but by the end of January we can begin to lose momentum. Once the excitement of new a beginning wears off we become susceptible to skipping the gym, missing a daily vitamin or falling off that proverbial wagon. When this happens, it’s easy to give up or push our goals off to next year, but don’t be so hasty! Resolutions are a process, not a one-time effort. Progress doesn’t happen overnight. We can begin to feel impatient and let down when we aren’t seeing significant results. Don’t fret, you’re only a month into your journey and change takes time. Instead of focusing on the fact that you haven’t hit your goal weight yet or become a more patient partner etc., focus on the everyday steps you can take towards your goals and celebrate miniature victories. Having a constant reminder of your initial intent will help keep you motivated long after you begin a New Year’s resolution. Making a commitment that will keep you accountable throughout the year can be a big help. Sign up for that full year of unlimited yoga or subscribe for one of our ongoing juice maintenance plans. 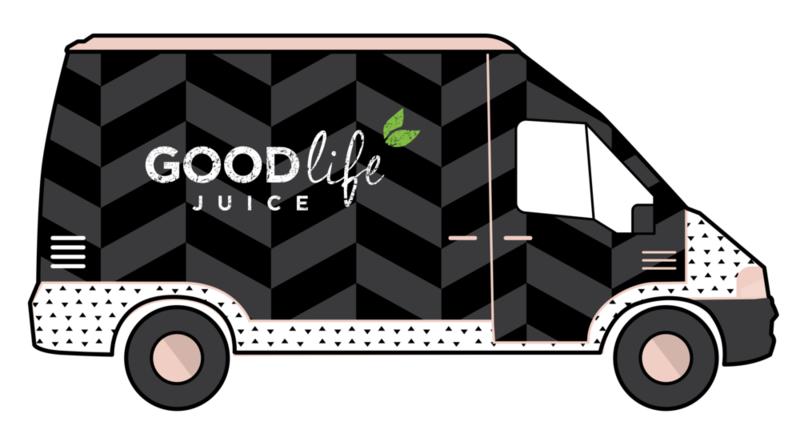 Having fresh juice delivered to you monthly will remind you of how motivated you were when you first set the goal and, even if all else fails, at least you’re getting in plenty of healthy juice! Talk to your friends and family about your goals and ask them to keep you on track if you start to veer away from your plan. Get a personal trainer or yoga instructor to work with you and keep you motivated throughout the year. Call us at Good Life Juice to get tips about nutrition and cleansing from our certified nutritionists. The more people you have working with you to accomplish your goals, the more likely you are to achieve them! So everything was going great until you ate that one piece of cake or missed that one day of meditating and now it’s all gone to the curb. Don’t be so hard on yourself! Success doesn’t require perfection. Setbacks are likely to happen and it’s important not to let them throw you off your game. Take them in stride, keep looking forward and don’t let one misstep become a habit. You’re doing great! If you have begun to let things slide, it doesn’t have to mean the end of your efforts. Hit the reset button and recommit. Just because it isn’t January 1st doesn’t mean it’s not a great day to begin making positive changes. Do whatever it takes to create the sense of a new beginning - take a spa day or do a juice cleanse to detoxify and reset your body for a brand new beginning.